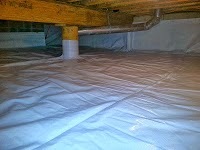 The crawl space encapsulation system, is a vapor barrier system designed to seal the crawl space off from the outside environment. Excessive moisture in the crawl space can cause many problems, such as mold growth, wood rot, musty smells, and foundation issues. A crawl space will typically get excessive moisture or water from the following three main areas. 1. Floor-The crawl space dirt floor, much like the soil around the house, contains moisture. This moisture is constantly trying to evaporate, and when it does, it makes its way up through the house with a process called stack effect or the natural airflow of the house, which is from bottom to top. 2. Foundation Walls-Moisture or water seepage from the exterior foundation walls of home and into the crawl space also increase the moisture levels in the crawl space. Many times stopping foundation wall seepage can prove to be very difficult. Trying the stop the seepage involves excavating around the entire perimeter of the home to the depth of the footer and re-waterproofing the foundation itself. Many times this is not possible due items that have been built around the home, such as slab porches, garages, sidewalks, additions, ect. 3. Crawl Space Vents-The idea behind having a vented crawl space was to allow air flow into the crawl space to reduce moisture. In reality what crawl space vents can actually do is dramatically increase moisture levels in a crawl space. This is especial true during the summer months. During hot humid summer days, the outside air flowing into the crawl space from vents contains a large amount of moisture in it. This moisture is brought into the crawl space through the vents. The hot, humid air will also come into contact with cooler air, pipes, and duct work and create condensation which also will increase moisture levels in the crawl space. This is even more so true for Indiana crawl spaces due to the type of summers that we have. Because of these reasons, a complete crawl space encapsulation system is installed along the dirt crawl space floor and up the foundation walls. Sealing off areas that cause excessive moisture in the crawl space. Part of a complete crawl space encapsulation system is to also seal off all crawl space vents. If the crawl space vents are not sealed off in a crawl space that has a complete encapsulation system, it will actually work again the encapsulation system by causing more moisture. Vents that remain open will allow hot, humid air that contains a great deal of moisture to enter into the crawl space. For this reason, it is never recommended to open the crawl space vents when a complete crawl spaceencapsulation system is installed. For more information on crawl space encapsulation systems or crawl space vapor barriers in the Indianapolis, Indiana or the surrounding areas click here.